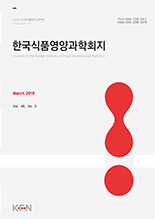 정복미, 신미옥, 김형락,(2012).천년초 줄기의 항균, 항산화 및 항암효과에 관한 연구.한국식품영양과학회지,41(1),20-24. 본 연구는 천년초 줄기를 이용하여 항균, 항산화, 항암 등 천년초의 생리활성 효과를 연구하였으며 그 결과는 다음과 같다. 천년초 줄기의 추출물중 gram 양성균인 4가지 균주(Rhodococcus equi, Staphylococcus aureus, Clostridium perfringens, Bacillus cereus)에서 항균 효과가 나타난 것은 메탄올과 핵산층이었으며, 4가지 균주 중 Bacillus cereus를 제외한 3종에 대해서는 우수한 항균효과를 나타냈다. 천년초 줄기의 peroxynitrite(ONOO-) 제거능 측정결과 핵산층을 제외한 메탄올층, 부탄올층, 수층의 항산화 활성은 천년초 줄기 추출물의 농도가 증가할수록 항산화 효과가 유의적으로(p<0.05) 높게 나타났다. 천년초 줄기 추출물의 각 용매별 DPPH 유리기 소거능은 농도가 증가함에 따라 소거능도 유의적으로(p<0.05) 증가하였으며, 부탄올>메탄올>수층>핵산층 순으로 높게 나타났다. 천년초 줄기의 암세포 증식억제 효과에서 피부암 세포의 경우 50～100 μg/mL의 농도에서 메탄올층과 핵산층이 수층과 부탄올층에 비하여 유의적으로(p<0.05) 높게 나타났다. 간암세포인 HepG2의 경우 추출물 100 μg/mL의 농도를 기준으로 메탄올층이 유의적으로(p<0.05) 높았고, 핵산층>부탄올층>수층의 순으로 나타났다. 대장암세포인 HT-29 역시 메탄올층이 유의적으로 가장 높았고, 핵산층>수층>부탄올층 순으로 나타났다. 유방암세포인 MCF-7은 메탄올층>핵산층>수층>부탄올층 순으로 효과가 높게 나타났다. 이와 같은 결과로 볼 때 천년초 줄기의 항균, 항산화, 항암 효과가 높게 나타나 줄기를 활용한 항균제품이나 여러 가지 가공제품을 개발하는데 기초 자료로 활용할 수 있다. This study was performed to investigate antimicrobial, antioxidant, and anticancer properties of Opuntia humifusa (OH) stems. OH stems were extracted with hexane, methanol, butanol and water. The methanol and hexane fraction exhibited strong antimicrobial activities on three strains of microbes, Rhodococcus equi, Staphylococcus aureus, and Clostridium perfringens. In the peroxynitrite scavenging effect (ONOO-) of OH stems, the antioxidative activity of methanol, butanol and water fraction but not hexane fraction showed significant increases in a concentration-dependent manner. The DPPH radical scavenging activities of OH stems were high in the butanol fraction compared with other fractions. Anti-proliferation effects on the B16-F10, HepG2, HT29, and MCF-7 cell lines were significantly higher in the methanol and hexane fractions than in the water and butanol fractions at 100 μg/mL concentration of extracts. These results suggest that OH stems can be used for the development of functional foods with biological activity.